Is it my imagination, or has the "face" of women's athletics changed drastically over the years? I'm a child of the 60s and 70s. I personally knew very few females who played sports. The ones who did were usually dubbed "Tomboys." There was a bit of a stigma associated with it. 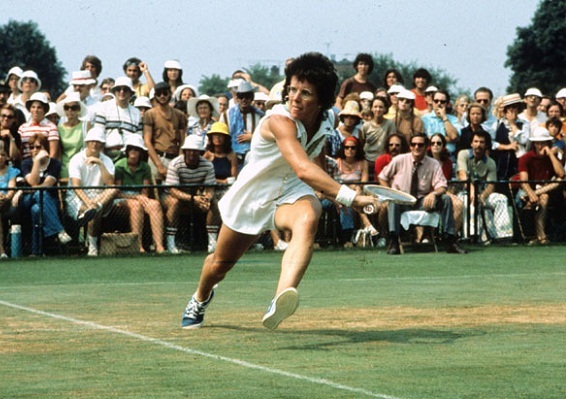 Don't get me wrong, there were some tremendous female athletes on the national and international level during those years -- Althea Gibson, Kathy Whitworth, Olga Korbut, and of course, perhaps the best of them all, Billie Jean King. Other than their athletic prowess, these women had something else in common. At the risk of sounding sexist, they just weren't considered particularly attractive. Not that they had to be, either then or now. But I've noticed in the past few years, particularly during these Olympic games, that at some point along the way, someone decided to turn supermodels into athletes. I'm not just talking about the beach volleyball players, who wear possibly the smallest bikinis I've ever seen (I'm not complaining). I actually noticed most of these women during the opening ceremonies, when they were all completely covered and wearing sweatsuits. These women are truly beautiful. Breathtakingly so. Long, flowing hair, incredible skin, searing eyes, and makeup (something none of the aforementioned women would EVER wear during competition). So what happened to change the female athlete from looking like the 1972 East German swim team to looking like they just stepped off the pages of Vogue and onto the sports field? A few weeks ago was the 30th anniversary of Title IX, the federal law that guaranteed equality for women in sports. Participation since then has skyrocketed. There are more women in competitive sports now that at any time in history. Because of that, it only stands to reason that, with more and more women playing sports, there would naturally be more and more attractive women playing sports, right? I also think that women athletes have seen Maria Sharapova, Anna Kournikova, and Danica Patrick parlay their looks, combined with their talent, into multi-million dollar marketing and sponsorship opportunities. So if you have athletic talent, why not highlight your other physical attributes if it can help make you more money? One of the biggest buzzwords going right now is personal branding -- which is just a fancy way of saying market yourself as best you can to capitalize on all your strengths. Well, trust me when I say that many of these women have quite a few "strengths" to show off. Aren't women in general better looking now then they were 30-40 years ago? Don't get me wrong, I know there where beautiful women back then also, but it just seems like women overall (not just in sports) have gotten better looking over time. I don't know if women have become better looking, per se, but there just seems to be so many more of them that fit that category. In the 30s and 40s, there were beautiful women, but they seemed fewer and farther between. Now, it seems that 3 out of every 4 women I see are beautiful.